The value of social media marketing for any business is akin to loading a premium gasoline in your car for a relatively cheaper cost. Social media can boost and help your brand cost-effectively go the distance. However, we all know that gas alone can’t make the car run. It needs a skilled person behind the wheel. Now, driving is a not a mindless work, isn’t it? It’s a skill that necessitates concentration and discipline. It involves knowledge and anticipation. In social media, like driving, you have to engage actively, navigate, and steer your engine to your desired goal. There is no push button to transport you instantly to your destination. A tweet here and a post there won’t make the cut. You have to be in the loop of things, always reviewing what works well and what doesn’t. How you conduct your ‘presence’ on social media platforms would much reflect on the image of your brand. You know that right? Companies who have high hopes for their brand, but with minimal or, worse, close-to-nothing social media knowledge, is like driving the car on a flat tire. It will not only slow you down, but it will also put your brand NOWHERE. Now, now, dab those eyes. Here’s what you can do. Consider the following tips below. If you are doing it wrong, by all means, change your style. If you are doing it right, speed on and enjoy reaping its benefits! What are the typical social media fails? SOCIAL MEDIA FAIL 1: All you do is like (or favorite) posts. You are engaging LIKE your customer!!!! But you see, you are not a customer. You are a business using social media to market your brand. Let’s adjust our thinking a bit and think like a marketer, specifically as a social media marketer. You want visibility for your company, right? With the entire horde of followers liking the same post that you liked, your chance to get seen is nil. Why is that? Your “like” gets lumped with the rest of the “likers.” But when you like a post AND leave a well-meaning and positive comment to a post, you just made your brand visible. Did you hear something “click” in place? So, let me ask you this: between liking a page and leaving a comment, which one is a more strategic and solve use of your time, as a business? Also, social media users are wary of spam-like messages. Dropping your company’s link to someone else’s post or using your hashtag though uninvited is – spam. Leave comments that are friendly, wholesome, witty and personal! Your goodwill will result to followers who will also show their appreciation by liking and commenting on your posts. It’s a win-win deal. SOCIAL MEDIA FAIL 2: You keep on sharing other company’s links. BENEFIT: Grow website referral traffic. Website referral traffic is a method that Google uses to report the visits to your page outside of its search engine. With this in place, you will understand how people find your website because it indicates which social media platforms are driving traffic the most to your site. It also indicates which of your posts are leading them to your site. You can check, anticipate and adjust accordingly what you are doing based on your social analytics data. As of 2015, there are 2.3B active social media users. I bet you had hoped to divert even just a minuscule of that to visit your site. Well, maybe not you, but we do – and mind you, your website is just one of the billion websites out there! So, how do you grow referral traffic coming from social media? It is by sharing posts coming from your site on your social media channels. Check this case study on Google+ as an example. SOCIAL MEDIA FAIL 3: You share posts, but you don’t engage. RIGHT: Carve out time to specifically engage. Yes, we need to post contents. However, we now live in 21st century, where social media enabled two-way conversation between you and your (potential) customers. Online communications can occur instantly, but it is fleeting and fickle. 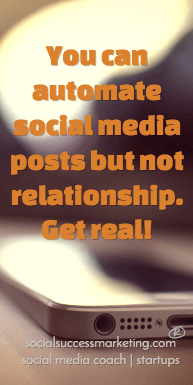 It does not build a relationship. Consistency is key. When they see how you engage, they begin to notice you, follow you and engage with you. Engaging consistently helps pave a way to building relationships and credibility. When you post a motivational quote, a funny photo, or a question and when people engage, bank on it right away. REPLY! When engaging, it can relay a message that you value and acknowledge their contribution. People like to be recognized. High-quality social followers are those people whose trust were earned. That’s a relationship we build with time, not with a quick hello, nor retweet. It’s easy to “get” marketing. Make sure you understand SOCIAL marketing, however. No trick. No special sauce. SOCIAL MEDIA FAIL 4: Your profile is incomplete. RIGHT: Complete profile and link to another site. With every social media accounts that you create, make sure your complete profile is displayed. Information about you or your company should be readily available in the bio section. Include a link to your website or your other social media profiles, so we know that you are not a fly-by-night account. All information in the profile is verifiable. There are no red flags to warn users to stay away. In other words, you are legit and not a scammer. People would want to know who, where, and what you are. They want to know what exactly you offer, and what it is to them for following you. Also, for those of us that use lists to manage conversations, either privately or publicly, it is helpful for us to know which category to place you. If you want quality followers, complete your profile! #SMTips” quote=”If you want quality followers, complete your profile! SOCIAL MEDIA FAIL 5: All you post is about your products and promotional offers only. RIGHT: Share contents that help solve your customer’s problem. Ever have a friend who only talks about no one but him/herself? I had. Likewise, posting all about your products and promotional offers do not necessarily convince people. It turns them off. Selling to them all the time is not the best way to connect to them. How can you make your audience trust you when they feel you are just there to get something from them? There is this 80-20 rule which means 80% of your post should be about your followers and 20% about you. The 80% should focus on how you can connect and how your product would make their life, or process, better. You can be regarded as a credible resource in your field when you share write-ups, studies, and tips that solves your customers’ problem. Staying active in social media and being a reliable resource are ways to build online authority. And when you are one, social media users run to you and not away from you. Social marketing is not an art. No, a successful social marketing is the right blend of preparation, research, and tactics. Know what you can and use it. Still feeling a bit lost? Stop over and let us know if you need directions on how to grow your engagement, web traffic, and leads! Watch this fun video that summarizes the above! There you have it. Have you seen a company doing either of these social media fails?